While Santa is busy up at the North Pole making his list and checking it twice, you should be doing the same with your lesson plans. December brings changes in schedules, unexpected interruptions to your routine and a general feeling of excitement in the air which often translates into chaos in the classroom if you aren’t prepared for it. This is the perfect time to plan research activities for your class to work on throughout the month. Research projects are chock full of reading, writing, drawing, and artistic tasks that will automatically create a quieter learning environment just by the nature of the activity. They are also ideal because they are great space-fillers when you find yourself with a random 20 minutes between a holiday assembly and lunch. Best of all, as students become proficient in researching on their own you will find that independent research projects are a purposeful activity for early finishers throughout the remainder of the year as well as an opportunity for enrichment and choice in learning. If you would like to offer something with a bit of holiday spirit to capitalize on their excitement, I suggest having them research different countries and their holiday traditions (this ties in perfectly with a Holidays Around the World Unit). You could also have them research and write about reindeer as a December project which will establish a strong foundation for future animal research projects. Consistency is important when it comes to classroom management. However, there are times throughout the year when it is beneficial to mix things up a little. If you find your students aren’t responding as well as usual to your normal behavior management system, try mixing things up a little by implementing something new this month. Alter your usual attention-getting strategy by shaking jingle bells to signal the need for them to stop, look, and listen. 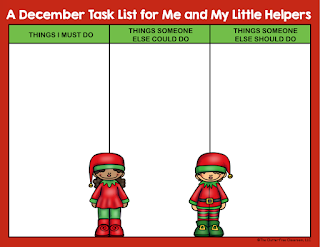 Some classroom teachers at all grade levels find it’s fun yo introduce a “Classroom Elf” to keep an eye on things. You certainly don’t need to go all “Elf on the Shelf,” but you could include a Kindness Elf or a stuffed snowman who watches the classroom and leaves positive notes for students who are caught being role models. Mix up your usual plan with new phrases or clipart. 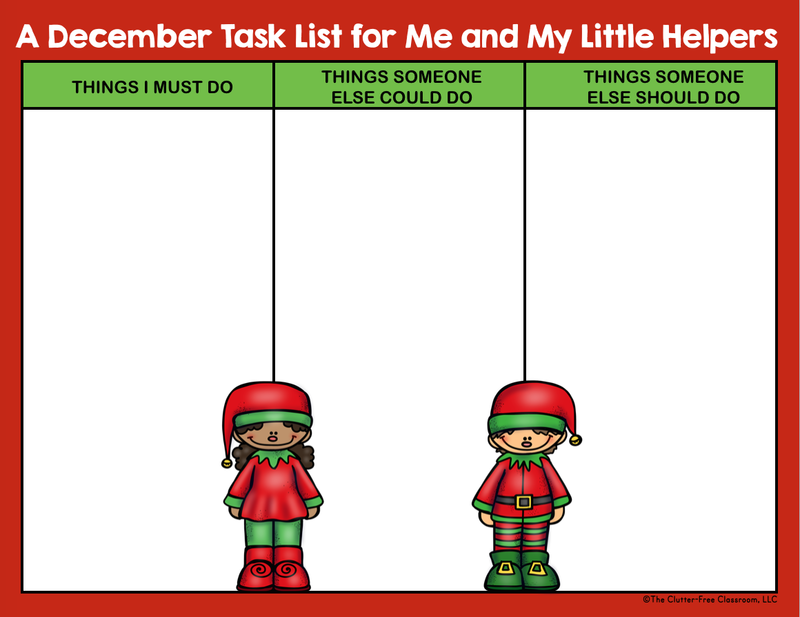 Check out this FREE Holiday Clip Chart as something new for the month. Implement a new whole class behavior plan to reach a fun goal such as a movie event or a game day in class. Be mindful of everything you really need to do and vow to do only those things. A simple way to streamline your to do list is to draft it in columns. Write down the things that absolutely, positively must be done by you in the left column. These are things like writing report cards, lesson planning for the New Year, etc. In the middle column list things that need to get done, but COULD be done by someone else such as a classroom aide, parent volunteer or capable students and alumni. In the right column list the things that SHOULD be done by someone else. These are the things that are not a good use of your time and can easily be done by others (organizing the classroom library, taking down a bulletin board, wrapping students’ presents to their families). Finally, use the back of the page to list things that are dancing around like visions of sugarplums in your head, but do not really need to get done (elaborate holiday bulletin boards, hand-made gifts for coworkers, etc) and do your best to let those go if time doesn’t allow. 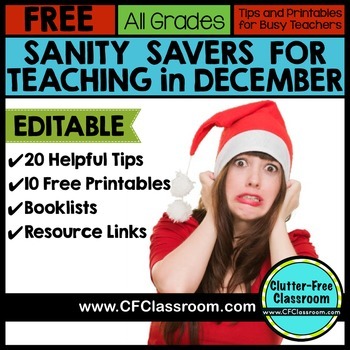 I encourage you to download my new FREEBIE…Sanity Savers for Teachers in December. 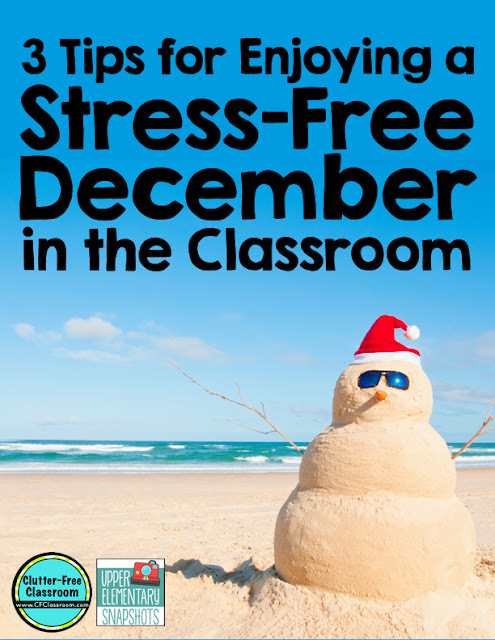 It includes 20 Helpful Tips for a Stress-Free December, 10 Free Printables to Use, Editable Files, Holiday Book Lists and Resource Links. 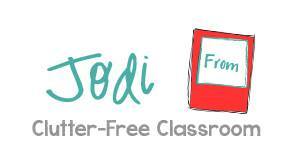 Please feel free to share it with other teachers. I hope you have a relaxed December in the classroom, a wonderful winter break and a happy and healthy New Year!